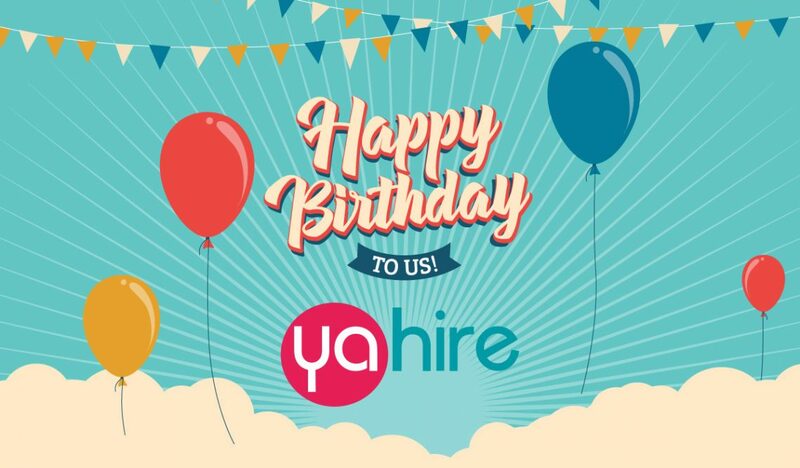 Yahire Ltd is Six Years Old! Yahire Ltd are pleased to announce that on the 13th April we finished our sixth year of trading. We are really proud of this achievement and want to say a huge thank-you to all our clients who have made this possible. In 2011, the founders of Yahire – Taran O’Doherty and Ben Leslie, came together to form the company after what they saw was a big gap in the furniture hire business. Typically companies hiring out furniture were using outdated methods of delivery that were overpriced with pretty low standards of customer service. Yahire wanted to change all that and decided that a 7-days a week service that provided value for money, high-end furniture and a top notch customer service was the only way to progress in the market. At the beginning, Yahire was just a two-man operation with a little over a couple of hundred items in storage. Through excellent marketing, customer service and intelligent purchasing, Yahire has built its reputation and client base to the point where it regularly services events in the largest and most prestigious venues across London. From starting off as a two-man band we are pleased to say that Yahire now employs over 60 wonderful staff, have a large fleet and a vast catalogue of well-kept hire equipment. We overstock in many areas so that we can accommodate last minute changes and we are still operating for 7 days a week. Now that we are able to buy in larger quantities we can actually, through economies of scale, offer CHEAPER prices in many instances than we did to begin with! Nowadays our clients range from venues, hotels, wedding planners, production companies, caterers, as well as providing less regular users such as brides, private parties, AGM’s and more. We have provided furniture for the BBC, Sky Living, ITV and many more famous clients. We are also ISO 9001 accredited and thanks to our new warehouse are able to stock larger quantities of furniture than ever before. Supplying furniture is not just about delivering various items and leaving it to the client to sort them out. We were asked to service a wedding at the Victoria and Albert Museum. The venue has particularly challenging logistics and we had a very limited time to deliver over quite a long distance and everything has to be just-so. When we had finished the delivery and took a step back at what we had achieved on that day, it was just incredible to realise that we’ve been able to build a team that can co-ordinate a large delivery to very specific requirements, and impress our customers as well as the venue. With your support we hope to continue to do so.